Batting gloves are an essential part of baseball and softball gear. For hitters, gloves are great in providing a better grip on the handle of their bat and allowing them to wield the bat more comfortably. Gloves are also great in diminishing any sting you may feel during hitting. Such sting, also called feedback vibrations, is quite common if you fail to hit the incoming baseball with the sweet spot of the barrel. And such feedback can make you feel quite uncomfortable after such as inaccurate hit. The gloves help mitigate the feedback and lets you enjoy a more comfortable swinging experience on the plate. However, not all gloves are created equal. The right pair of gloves is simply one that feels right on your hands and enables you to improve your hitting. Well-made gloves accomplish this by ensuring a better grip which, in turn, results in better swinging. If you set out to get a pair of batting gloves, chances are you will find it a hard task. There is a virtually endless variety of batting gloves available on the market, and it can be tough to determine which of these is right for you. To make things easier, we have shortlisted 5 of the best batting gloves available on the market right now. In short-listing these five products, we have considered a number of factors such as weight, the amount of padding, variety of color and other options, the material used in their construction, size adjustment options, durability as well as price. 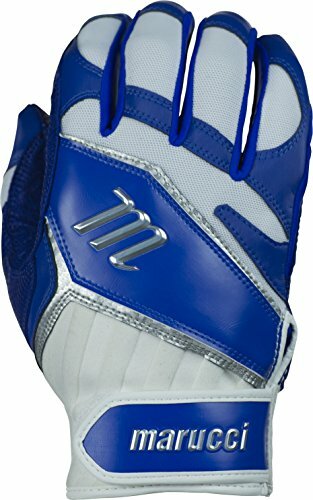 We are positive that once you go through these quick reviews, you will be able to find the batting gloves which suit your style, needs, and budget perfectly. 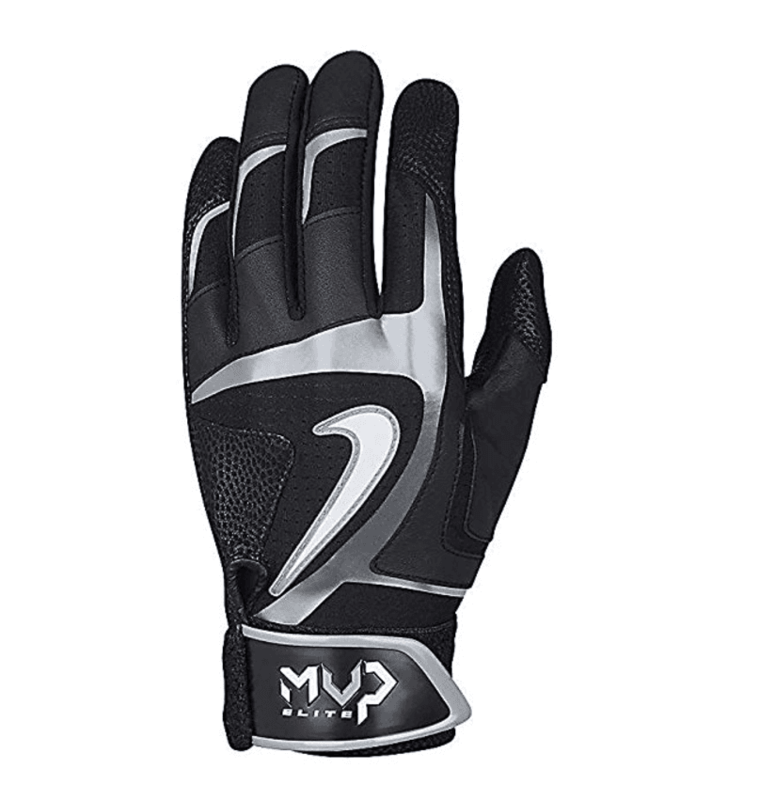 The Nike Adult MVP Elite Batting Glove is one of the best set of batting gloves out there. These gloves bring together great comfort, a good fit, a durable construction and a wide range of other useful features. 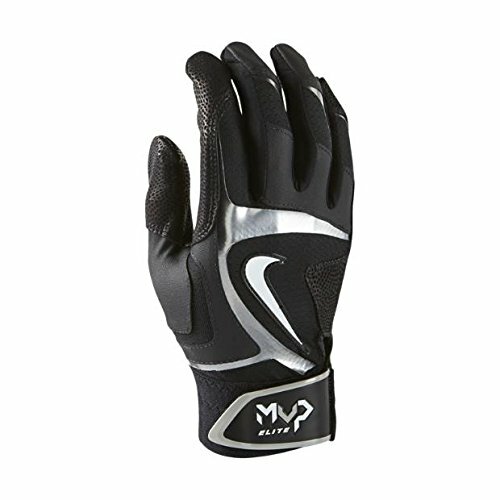 To top it, the gloves come with the quality guarantee of Nike, a company known for manufacturing premium-quality baseball products. Nike has constructed these gloves using 55% sheepskin leather. This gives these gloves their trademark soft feel which is perfect if you are wearing them during a hard-hitting session on the plate. Nike has also used 17% polyester and 8% nylon to improve the overall durability of the gloves. These gloves are designed with a textured feel so that not only do they offer a very comfortable feel but also allow you to improve your grip on the bat handle. Another stand-out feature of the MVP Elite gloves is that they have a mesh design on the back of the hand. This ensures that the gloves are breathable and offer a solid degree of ventilation to avoid any sweat build up during the game. The feature is particularly useful on exceptionally hot days when you really need a dry and firm grip to hit well. Finally, these gloves come with a hook-and-loop closure, allowing you to adjust them perfectly to your size. The adjustable wristband enables you to adjust the fitting of the gloves exactly according to your needs and preferences. Nike has added reinforced the design of the key flex-points of these gloves, making them more durable and giving them a sturdier feel. As a result, these gloves can offer a great balance of comfort and sturdiness. The MVP Elite gloves are available in a wide range of color options. These include Black/Black, White/Orange, Blue/White, White/Royal, White/Volt and Navy/White. They are only available in adult sizes. The Marucci Elite Batting Gloves is another pair of gloves that has made our list. Marucci is known for creating baseball products that not only perform well but also carry the signature elegance and sleek outlook for which the company’s products are known. This is true for the Elite gloves as well. Marucci has used a simple and durable design in the construction of these gloves. The company has used premium-grade sheepskin leather material in the construction of the palm, making sure that the gloves feel incredibly comfortable on a player’s hand and offer a solid degree of padding during hitting. The overall design of the palm is completely free of any seams. This gives the gloves an extraordinary smooth feel and ensures a better fit for the player. Marucci has used mesh and Lycra materials on the back of the gloves. This enables the gloves to be breathable and ensures that there is no sweat buildup on the player’s hands. As a result, the player can continue to swing with confidence and a firm grip while wearing these gloves. The gloves also feature a Lycra wrist closure insert. This feature ensures that players can customize and adjust the fitting of these gloves on the go. The Marucci Elite batting gloves are available in a wide range of options. These include Blue, Electric, Red, Black, and White. These gloves are only available in adult sizes. 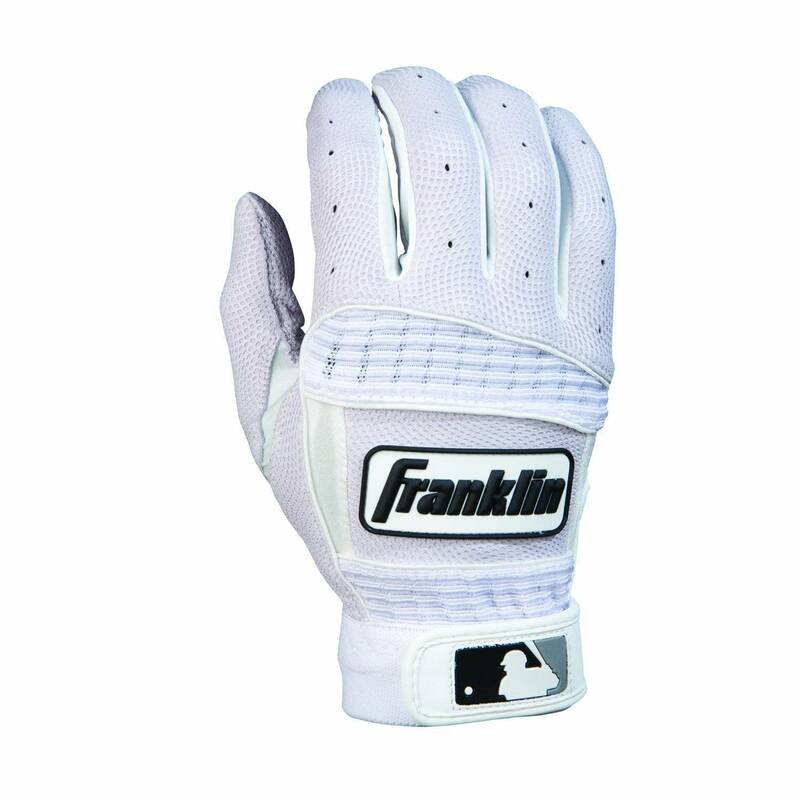 The Franklin Sports Neo Classic gloves are another pair of high-quality, high-performance gloves. The company has constructed these gloves using Pittards Digital sheepskin leather. This enables the gloves to offer a very comfortable and soft feel while at the same time, staying tactile and offering an excellent grip in all weather conditions. The Neo Classic gloves also feature the floating thumb technology. This allows the glove to offer better adaptability and grip on the bat’s handle, ensuring a more confident and smooth swinging motion during hitting. The palm of the gloves features a one-piece leather construction which offers a very comfortable feel and ensures that the design remains durable over a long period of time. These gloves come with professional grade spandex wristband support. This not only ensures that the glove fits better to your hand, it also reinforces your wrist and significantly reduces friction in your swing motion. 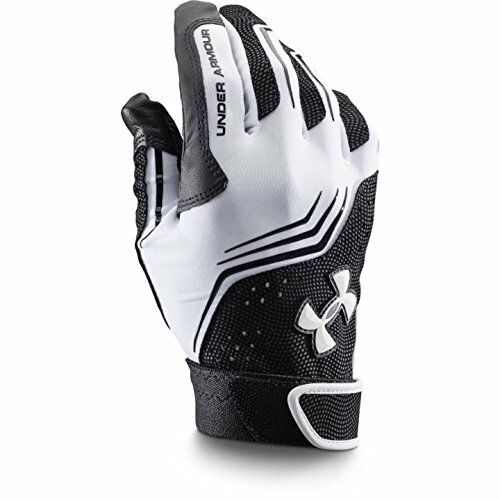 As a result, players can achieve a significantly improved swing motion while wearing these gloves. In all, the Neo Classic is designed to ensure that they can adjust to the curves and contours of your hand perfectly. As a result, you get an incredibly comfortable and perfect fit with these gloves. These gloves also feature the Quad-Flex, which prevents any bunching up of glove material between your hand and the bat. So you get to experience a consistently smooth and reliable grip with these gloves. The Neo Classic gloves are available in a wide range of options. These include Pearl/White, Black/Black, Black/White, Pearl/Black, Gray/Royal, Pearl/Pink, Pearl/Royal, Pear/Forest Green, Pearl/Gray, Pearl/Burgundy, Pear/Yellow, Royal, and Red. You can also choose from Small, Medium, Larger, Extra Large and Double XL sizes. 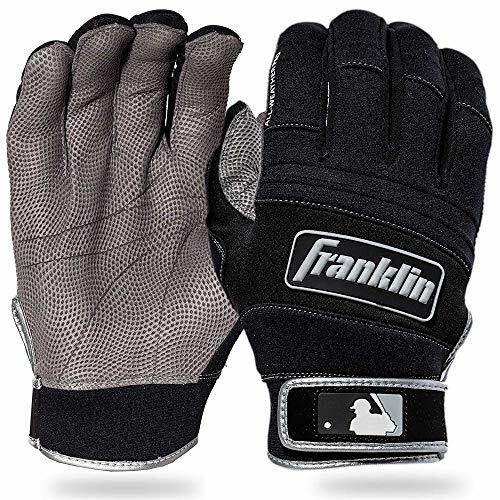 The Franklin Sports MLB Cold Weather gloves are specifically designed to deliver optimal performance in cold weather conditions. To this end, the company has designed these gloves to offer the dual advantages of warmth and grip. 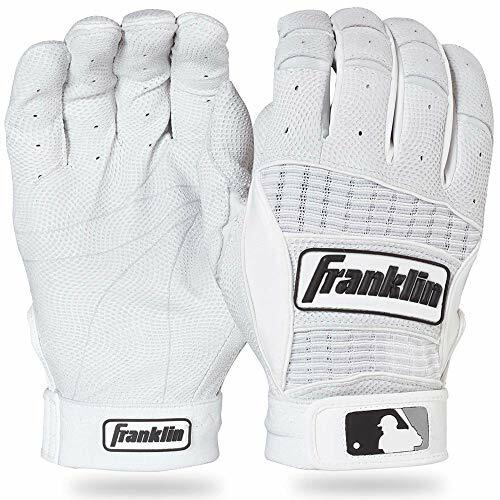 Like most other batting gloves from Franklin Sports, the MLB Cold weather gloves are constructed using Pittards Digital sheepskin leather. This material ensures that the gloves offer a comfortable feel and remain durable at the same time. The company has also used its trademark Quad-Flex technology in the construction of these gloves. This feature ensures that the glove material doesn’t bunch up to form material buildup between the player’s hand and the bat handle. So you get a consistent, comfortable and firm bat handle feels while wearing these gloves. The design of the MLB Cold Weather gloves features a seamless leather palm. This ensures that the players can enjoy an absolutely smooth swinging experience while wearing these gloves. One of the truly stand-out features of these gloves is the insulated neoprene back. This ensures that the heat from inside the gloves is insulated within during cold weather. As a result, these gloves keep your hands warm when you are swinging on the plate in chilly weather conditions. Although the gloves are perfect for keeping your hands warm, they are also breathable, ensuring that phenomenon like cold sweat build-up doesn’t occur while you are wearing these gloves. These gloves are available in a wide range of color options. These include Black/Red, Black/Black, Black/Royal, Black/White, Pearl/Black, Pearl/Royal, Pearl/Red, Pearl/Navy and Black/White Digital Camo. You can also choose from a wide range of size options. These include Small, Medium, Large, Extra Large, Double XL, Youth Medium and Youth Large. 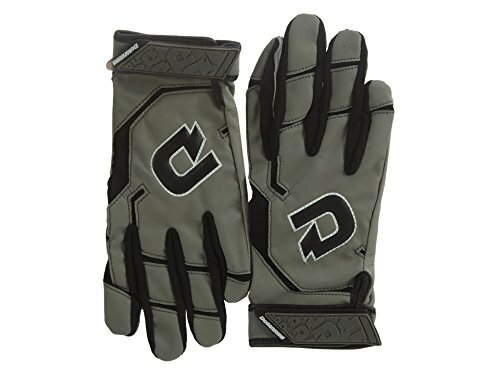 The DeMarini Women’s Superlight Batting gloves are another pair of gloves to have made our top 5 list. These gloves are specifically designed to fit the hands of women players and to bring together performance, comfort, and durability. DeMarini is known for manufacturing premium-quality baseball equipment. This commitment to excellence and quality is also reflected in the Superlight gloves. The Superlight gloves feature leather palms which are constructed in a one-piece design. The single-piece design gives the palm a perfectly seamless and smooth feel. This ensures that when players hold a bat while wearing these gloves, they can achieve a consistently firm and comfortable grip. 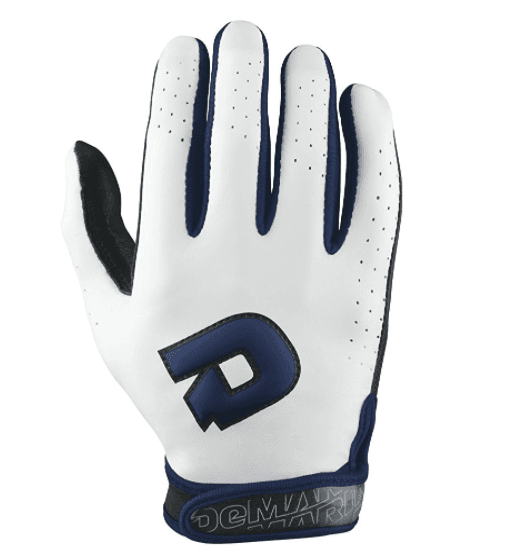 To add further to the comfortable feel of these gloves, DeMarini has added finger and heel pads. These pads ensure that even when you are hitting the hardest pitches, you feel minimum feedback on your hands and can continue swinging with comfort. The back of the Superlight gloves features a one-piece perforated design. This makes the gloves breathable and regulates the moisture content within the gloves. As a result, there is no sweat buildup on the player’s hands and the player can maintain a steady and firm grip on the bat handle even in hot weather conditions. Finally, these gloves come with a molded low profile DeMarini wrist strap. This strap allows the players to adjust the fitting of the glove exactly to the size of their hands. With the strap, players can achieve a better fit which ultimately translates into more confident swinging on the plate. DeMarini has also included a Neoprene band in the wrist strap. The Neoprene band reinforces your wrist and significantly reduces wrist friction during swinging. So you can expect a noticeable improvement in your swinging action while wearing these gloves. The DeMarini Women’s Superlight batting gloves are available in a range of color options. These include Navy, White, Scarlett, Pink, and Royal. You can also choose from Small and Large size options. It takes some time and a considerable effort to find the right pair of batting gloves. 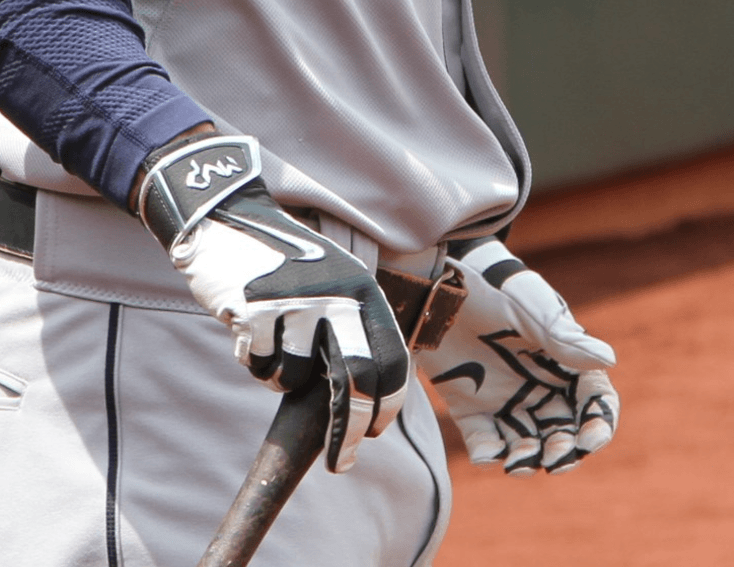 We have trimmed both down by bringing you this list of top 5 batting gloves. However, even when choosing among these top options, you will have to consider your personal needs, style, and preferences. Do you want a pair of gloves that offer great grip or are you more interested in one that offers superior padding and mitigates negative feedback on the handle? Do you want a breathable and light-weight pair of gloves or one that can keep your hands warm in really cold weather conditions? These and many other considerations ultimately inform your final choice and help you finalize the perfect pair of gloves for you. It is important to note here that most batting gloves are general-purpose whereas some are meant to offer specific features. 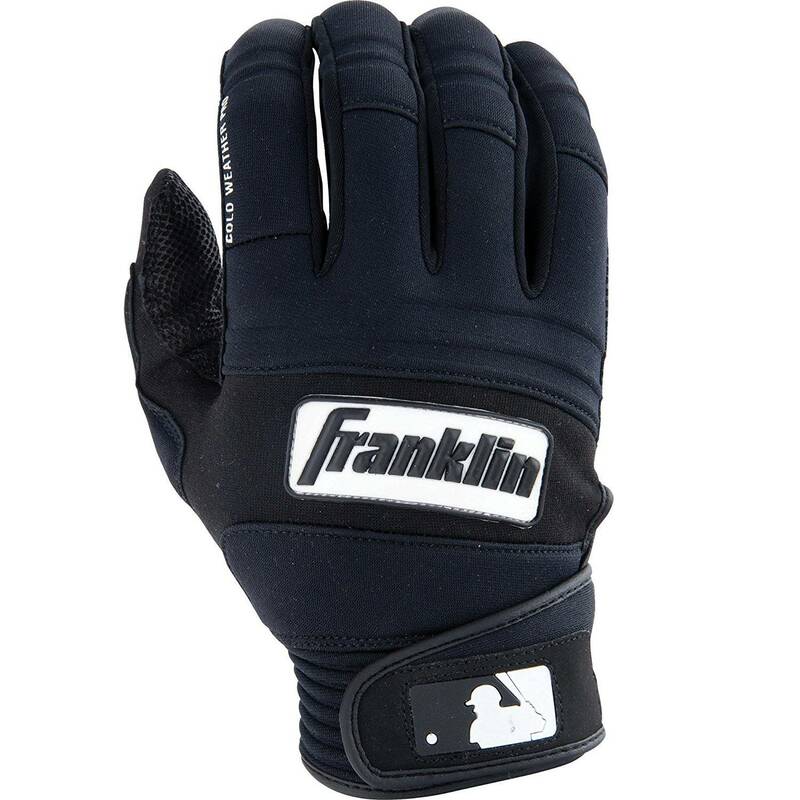 A notable example from the list above is the Franklin Sports MLB Cold Weather gloves. These gloves are specially designed to help players maintain their performance levels in cold weather conditions. However, most players usually need a good set of general-purpose gloves. A good pair of such gloves offers a good degree of padding, a great fit, decent ventilation to keep the gloves breathable, a design that ensures a firm and comfortable grip on the bat and a wrist strap in most cases. Even with such stock features, it can be a difficult task to choose between different general-purpose gloves. We do hope that with this quick guide, we have made the task somewhat easier for you.